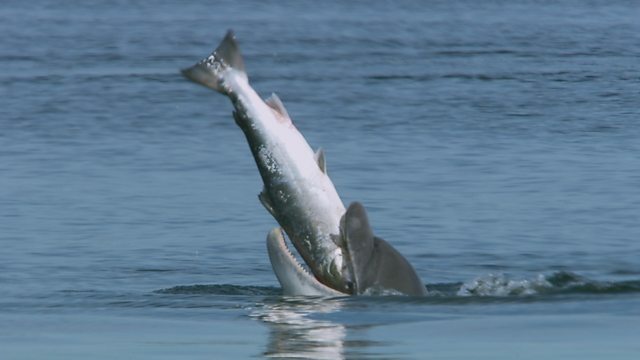 BBC One - Highlands - Scotland's Wild Heart, Spring - Season of Extremes, Why do dolphins vomit Atlantic salmon? Chanonry Point, juts out into the Moray Firth North East of Inverness providing an ideal spot to catch sight of some of the bottlenose dolphins that frequent the seas around Scotland. They normally hunt mackerel, squid and herring, but here at Chanonry Point they are in search of a particular favorite on offer…Atlantic salmon. Salmon heading inland to spawning grounds in the swollen Highland rivers are brought in by the tide. They gather in a deep narrow channel, providing ideal conditions for the perfect dolphin ambush. However, ambushing the salmon is only half the battle, they still have to be eaten and a big Atlantic salmon prove to be a bit of mouthful! They need to go down in exactly the right way and the dolphins goes through a process of regurgitating and re-swallowing the fish to manoeuvre it into the perfect position to slip down. This is an unusual and often comedic spectacle.